With their feathery gills, soft little eyes, squishy smile, not to mention their overall adorable appearance, the axolotl has won over the hearts of cultures since the time of the Aztec Empire where they were incorporated as a mythical god. Today, axolotls are prevalent pets in home aquariums around the world. They have appeared in Diego Rivera murals as well as in Pokémon video games. If you are aware of the “How to Train Your Dragon” films by DreamWorks Animation, you may notice the resemblance of axolotls in one of the main characters – our salamander friend helped inspire the appearance of the dragon, Toothless. In the popular Netflix series Bojack Horseman, there is an anthropomorphic axolotl character named Yolanda. Undoubtedly, the charismatic creature has managed to intrigue us far beyond the extent anyone might expect from such a small, slippery little critter. In addition to a cultural appeal, axolotls are fascinating model research organisms. This is primarily because of their ability to regenerate. They can regrow missing limbs, tails, organs, parts of the eye, nervous system, and brain. They can even change between sexes (Vance 2017). Regenerative biologists have been studying them for decades to understand their regrowth abilities and potentially apply their findings to humans. No doubt, the axolotl is a special kind of salamander. Unlike other salamanders, this species maintains its juvenile morphology and remains aquatic its entire life. This unique “forever-young” feature is one reason axolotls are so widely popular. The axolotl is the most widely distributed amphibian worldwide because of its attraction as a pet and its status as a model organism in biomedical research. At the same time, this species is on the verge of extinction in its native habitat, giving it the unique status of a “conservation paradox”. Compared to most other species, the axolotl is evolutionarily still a baby, originating from central Mexico less than ten thousand years ago (Wanderer 2018). They historically inhabited the shallow regions of Lake Texcoco (Fig. 1), the lake famously known for the location of the Aztec city, Tenochtitlan (“Ten-ach-teet-lan”) (est. 1325) which was located on an island in the center of the lake. During the Aztec rule and subsequent Spanish capture in 1521, civilization expanded within the lakebed and eventually the lake was drained into the Pánuco River through series of canals and tunnels. Today, almost the entire lakebed is occupied by Mexico City. The axolotl’s native habitat would have been entirely lost had it not been for the canals of Xochimilco (“Zoe-chi-meel-koh”). Xochimilco is a Mexico City borough that includes 65 square miles (170 km2) of crisscrossing canals where wild axolotls still roam. The canals are all that remain of the great Lake Texcoco which used to cover over two thousand square miles (>5,600 km2). Historically, the canals supported a Mesoamerican agriculture system that used small, artificial islands (chinampa) to grow crops on shallow lake beds. These days, the canals and their floating gardens are famous for recreation and tourism. Visitors rent colorful gondola-like boats to ride up and down the canals while various food and drink vendors and mariachi bands float by in their own vessels offering their services (Fig. 2). The festive atmosphere is such a boisterous distraction, one can easily forget that below them in the murky waters lives a population of wiggly, gray salamanders hiding in the aquatic vegetation. 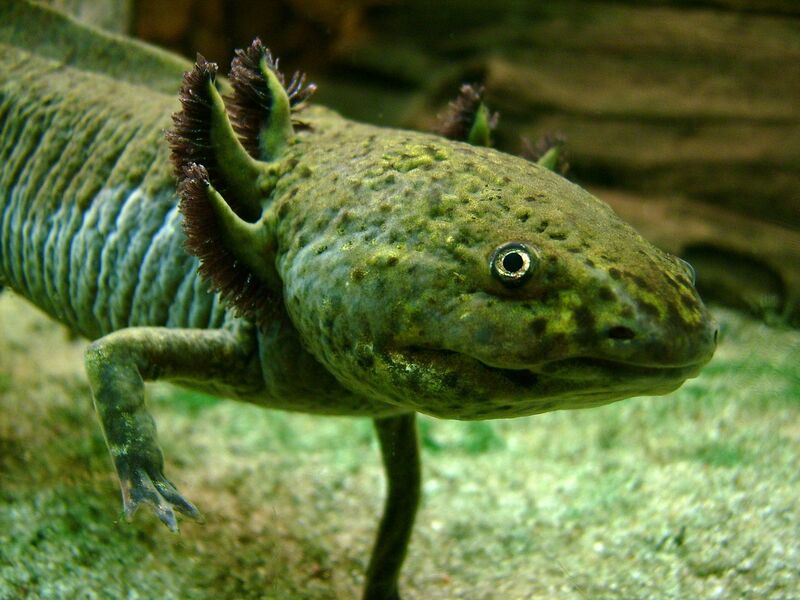 Despite their global popularity, the first robust study on axolotls in their native habitat was not until 1998 by Dr. Luis Zambrano who estimated about 6000 axolotls per square kilometer in the canals of Xochimilco. He has replicated the survey several times, documenting an alarming downward trend: 1000 salamanders per square kilometer in 2000, 100 in 2008, and by 2017 the estimated density was a mere 35 salamanders per km2 (Vance 2017). A few key threats have been identified as responsible drivers of this decline. First, the common carp (Cyprinus carpio) and tilapia (Oreochromis niloticus) roam the Xochimilco canals along with the axolotl. These exotic species were introduced into the canals in the 1970s and 1980s by the government to increase local food sources, but they also fed on juvenile salamanders and salamander eggs. The other major threat comes from the poor water quality of the canals. Human waste often makes its way into the waterways, along with heavy metals and other toxins, degrading the overall health of the waters. Salamanders absorb oxygen and other compounds through their permeable skin, making them vulnerable to some of these pollutants. Even with their proliferation in our culture, the abundance of captive axolotls does not translate into a safe status for the species. Artificial selection for science and breeding has produced little genetic diversity among captive axolotls. A severe reduction of a species’ gene pool, known as a “genetic bottleneck”, actually increases the risk of disease and vulnerability to extinction (Friese 2009). Fortunately some conservation efforts are underway. In 2006, the species was listed as critically endangered by the International Union for the Conservation of Nature and continues to be protected under the Convention on International Trade in Endangered Species agreement. The number of abandoned agriculture fields in Xochimilco has also presented a prime opportunity for a salamander refuge. A land grant from the federal government provided the first step in acquiring area for the protection of the axolotl. The conservation program, operated by Dr. Zambrano of Mexico’s National Autonomous University, includes filters on the canals to prevent predatory fish from invading axolotl habitat. In efforts to boost the native population, lab-bred salamanders are frequently released into the protected agricultural canals. Over the next several years, Zambrano’s team hopes to acquire about half of the Xochimilco canals, increasing protected axolotl habitat as well farm acreage to grow organic certified products to financially support the refuge (Vance 2017). As the district continues to urbanize, pressure will increase on the canals. Maintaining areas of refuge, such as the ones run by Dr. Zambrano, is likely the only way to maintain human and axolotl coexistence into the future. Axolotls are not the only species to find themselves in a conservation paradox. Polar bears, giant pandas, whooping cranes, green sea turtles, and emperor penguins, among many others, are all species that have captivated human culture. At the same time, they are all listed as vulnerable or endangered as their global populations creep towards extinction. Like the axolotl, conservation efforts are ongoing for many of these species, but much of these efforts rely on continued public support, appreciation, awareness, and education. To that end, I hope the next time you are in a pet store, or at a friend’s house, and happen to notice our feathery-gilled friend in an aquarium, you can note the extraordinariness of the little creature: how biologically unique, how culturally special, and how ecologically impressive one little salamander can be. Friese, C. 2009. Models of cloning, models for the zoo: rethinking the sociological significance of cloned animals. BioSocieties 4(4): 367–90. https://doi.org/10.1017/S1745855209990275. ← Who are we going to call when rainforests are suffering from droughts? Termites! Wow, what an interesting species for so many reasons. I hope it’s not too late for Mexico to save it. Perhaps they could be a model for the US on how to coexist with endangered species.